The Crowd Switch Shader for V-Ray is a V-Ray shader which can be used to add some visual diversity to the rendered crowd. It lets you vary the texture/shader which will be applied on the same mesh on different Entities. 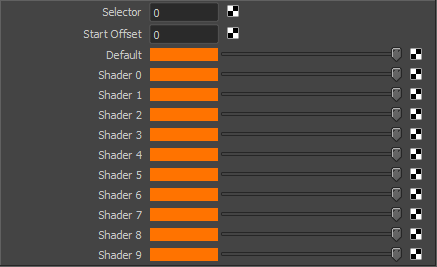 This shader consists of several inputs for available textures/shaders and a selector determining the input to choose as output color. To create a Crowd Switch Shader for V-Ray, the V-Ray plugin (vrayformaya) must be loaded. 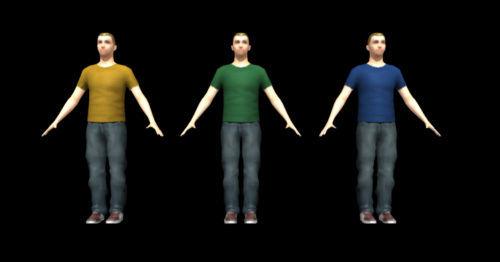 In the following example the Crowd Switch Shader has 3 textures connected to its 3 first Shader slots. 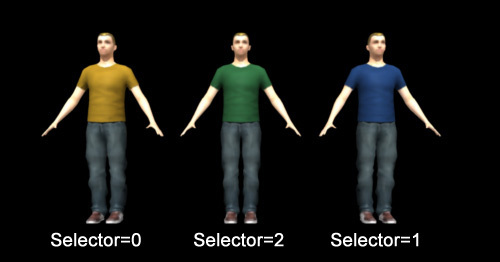 Its Selector value is fed by a V-Ray User Scalar shader and its output is connected to the Color attribute of a Blinn Tshirt shader.